Maintaining normal gynecological functions, to regulate female hormone, cycles, alleviate cramps and mid-life hot flashes, to stop hair loss, and to maintain youthfulness. Dong Quai Lady’s Herb Tea (Tangui Lady’s Herb Tea), an excellent drink flavored with jasmine flower, is made of the famous Chinese Dong Quai (Angelica chinensis) grown on the pollution-free high plateau of northwest China. 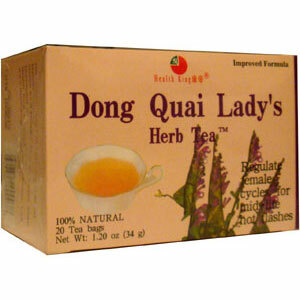 Dong Quai contains fatty acids, succinic acid, various amino acids, volatile oil, B12, etc., and as a blood builder and circulator, is used in Chinese medicine for maintaining normal gynecological functions, to regulate female hormone, cycles, alleviate cramps and mid-life hot flashes, to prevent hair loss, and to maintain youthfulness.